Recently several Aiken area players competed in the Powerade State Games in Winston-Salem, NC. Click here to see highlights of Josh Booth and Jay Campbell playing Aspen Kern and Ernesto Farjardo. Although our guys did not come out on top this time, the two matches in the highlighs were extremely competitive with scores of 11-4, 11-13, 11-1 in the first match, and 16-14 in the second. 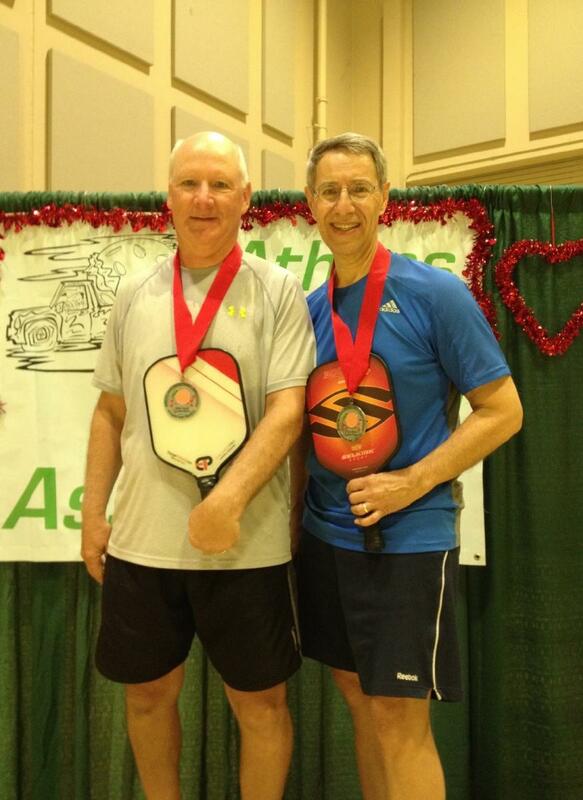 It was great pickleball! 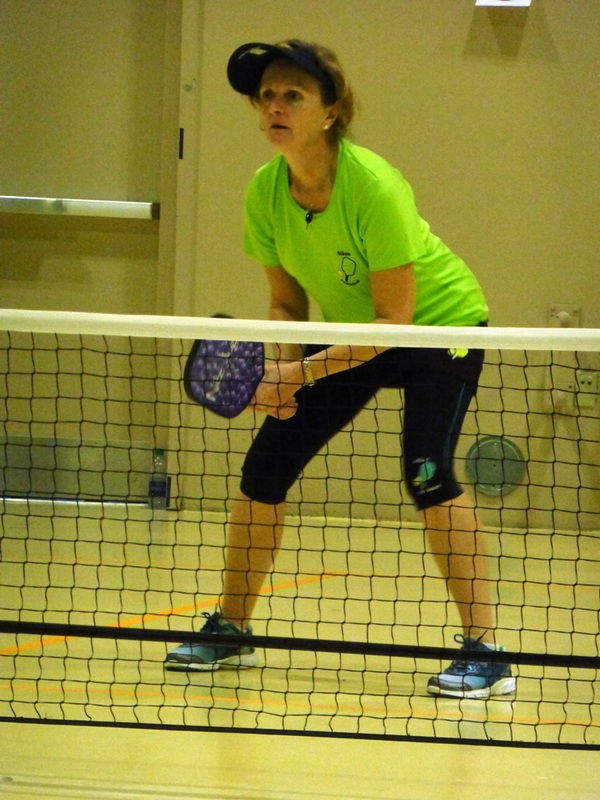 Newman Tennis Center in Augusta held its first Pickleball Slam on July 15 and 16. The Aiken Pickledillys gave an outstanding performance. We learned you can’t spell “Double Gold” without “Doug”. 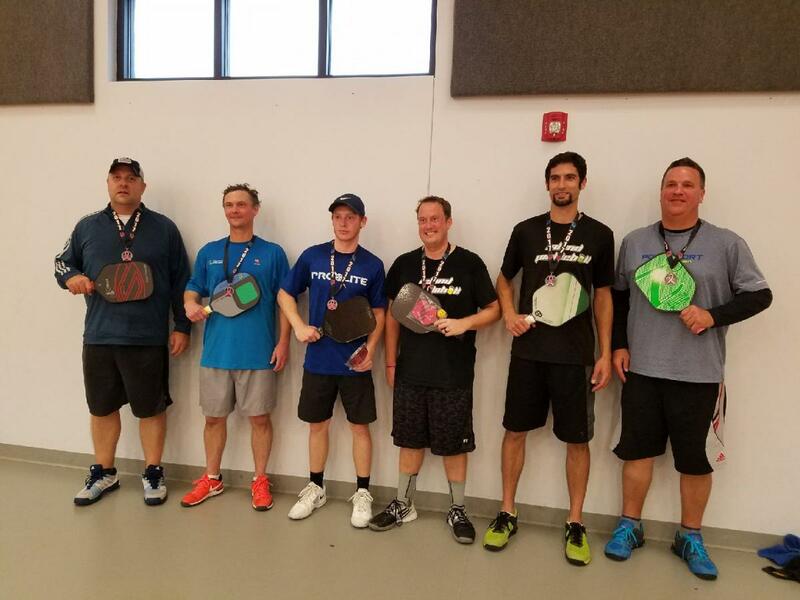 Our very own Doug Lilly capped an impressive weekend by winning the Intermediate Mixed Doubles gold with partner Chris Powers in a thrilling three-game finals match with fellow Pickledillys Marian Garcia and Jim Kabel. 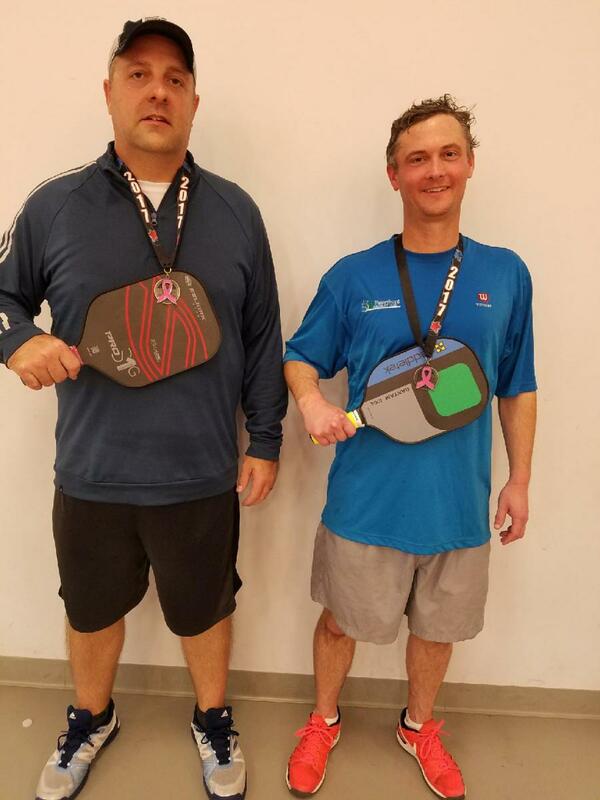 On Saturday, Doug shook off a sore neck, put his partner Jim Hughes on his back and carried the team to a gold medal in the Intermediate Men’s Doubles. Let it never be said Doug can’t play with pain! Marian and Chris already knew the way to the medals podium since they also won silver in the Women’s Doubles on Saturday. They won three out of four matches in the round-robin format. The Aiken contingent was also well represented by John Fuller, Jeff Beckner, Sue Talada and Russell Crews. We also want to congratulate some Augusta players who often find their way to Odell Weeks. 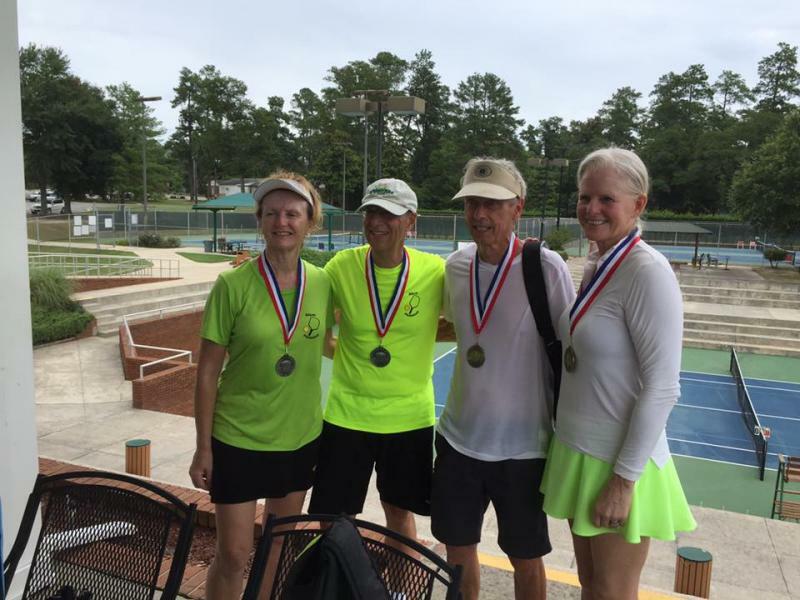 Denisse Martinez won two golds (Women’s Doubles, Advanced Mixed Doubles), Anne Rheins won gold in Women’s Doubles and Daniel Davis won gold in Advanced Mixed Doubles. 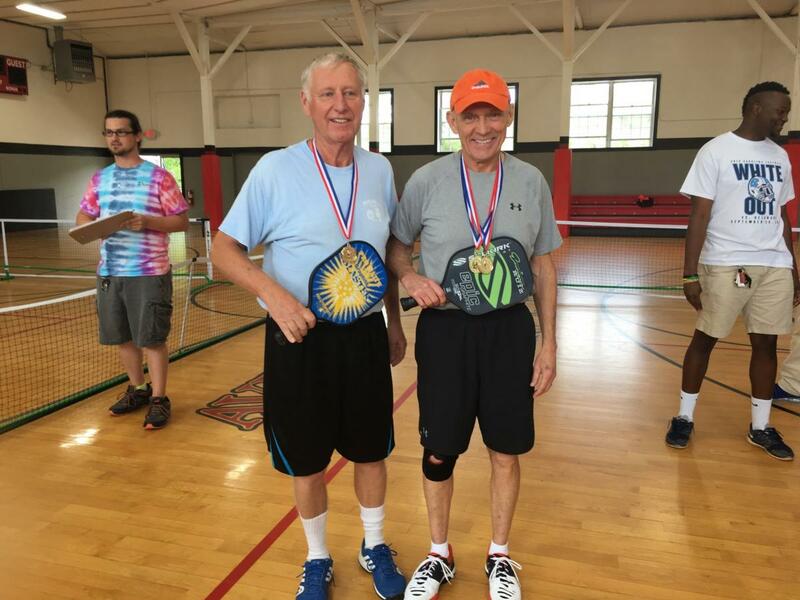 Kim Sharpton fought his way through the consolation bracket twice, with his son Bilal in Intermediate Men’s Doubles and his wife QP in Intermediate Mixed Doubles. Make sure you congratulate these players next time you see them! It was an indoor tennis facility for the Wake Forest Tennis team, with 8 temporary pickleball courts set up. We played with the Onix II pure outdoor ball. Jordan and I decided to play in the 19+ division in order to try to play some younger, better competition. The 35+ draw, which Tony Quick and his partner, Franz Roland ​played in, was just as strong, and may actually have had more 4.5 teams competing. But, since Jordan and I had played all of those teams recently, we opted for the 19+ division in order to get a shot at the 2 time US Open pro doubles champion, Kyle Yates. We got our first chance to play Kyle after winning our first 3 matches in the main draw, beating some decent teams along the way. Two of our matches went 3 games. Yates and his partner, Daniel Parker, beat us handily 11-2 and 11-3. Jordan and I both feel we did not give it our best effort. We think a combination of nerves, and just plain over-thinking the fact that we were playing the best guy in the sport lead to a lack-luster performance. After the loss to Yates and Parker, we next played the winner of the back-draw, who we beat for another chance to play Yates/Parker for the gold. While we played them tougher in the next attempt, and got the best of Yates on several points, we were just not up to the challenge of taking down Goliath that day. We lost 11-0 and 11-6...finally starting to play our game in that last game, but of course it was too late. Yate's partner, Daniel Parker is a rising 4.5 player whose game is getting better every time we see him at a tournament. Overall, we had a great weekend. We walked away with a silver medal. Playing Yates was the highlight and lowlight, but regardless, it was good experience playing against someone of his caliber. We want another shot at him, and hope to get it soon. On May 22, 2017, Beverly and Keith Shaver participated in the High Country Senior Games in North Carolina. Beverly and Keith had a hugely successful day. 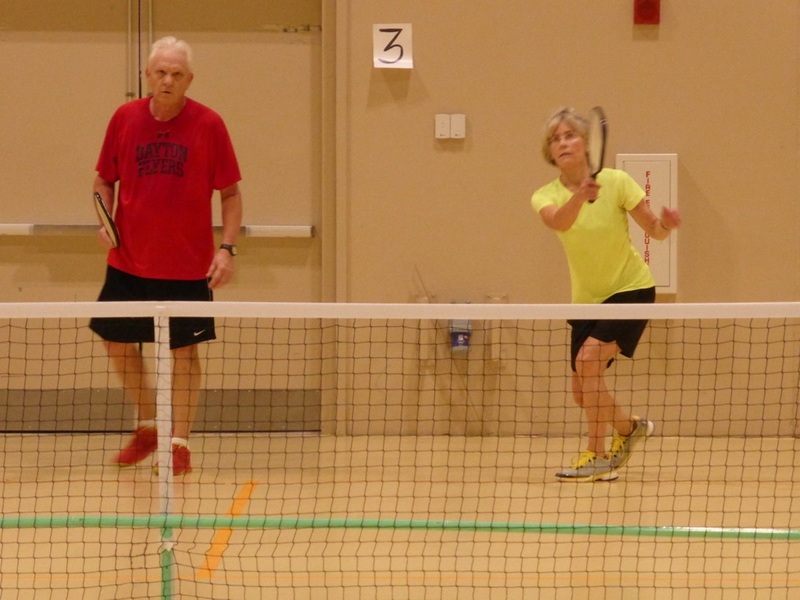 Not only did they win the gold playing together in mixed doubles, but Beverly placed first in women's doubles (with partner Cookie Parker) and Keith placed first in men's doubles (with partner Don Blasberg). 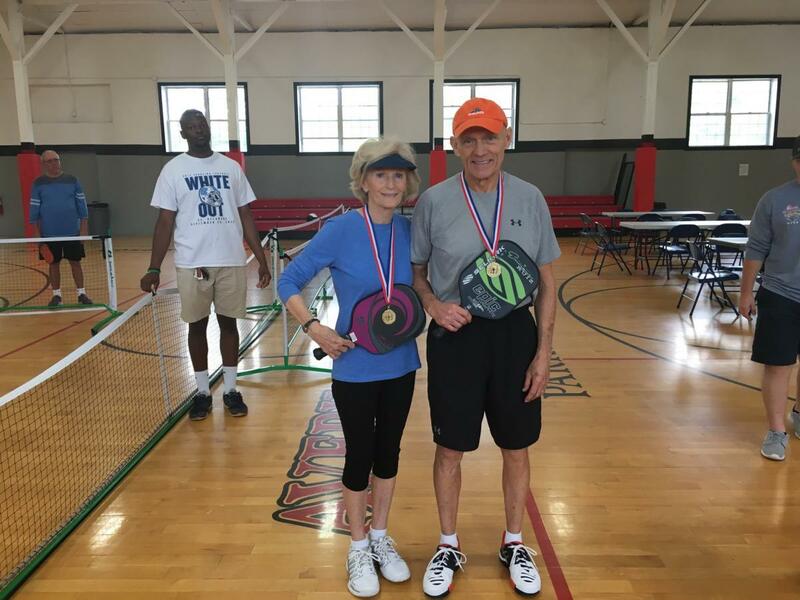 By winning these medals, Beverly and Keith qualify to participate in the North Carolina Senior Games in Concord, NC in October. 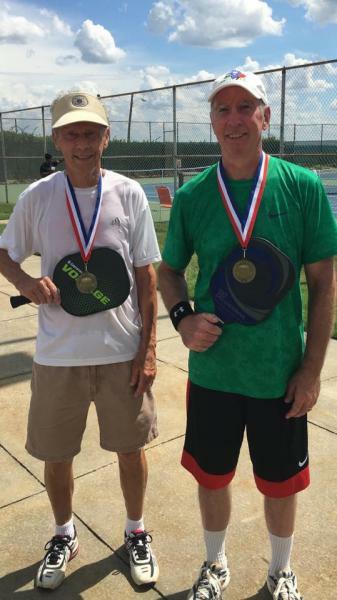 Jordan and I played in the Men’s age 40-45 "open" doubles draw, which was made up of 12 teams from all over the country, in a double elimination format. Players aged 40-45 could enter the draw, and all of the players were either 4.5 or 5.0 rated. 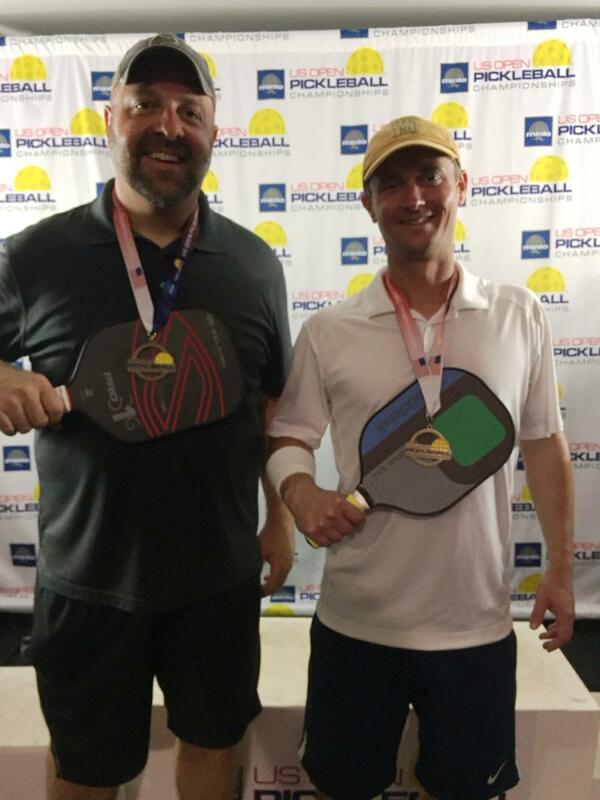 Three of the teams in our draw were also entered in the “Pro” division of this year’s event, one of which (DJ Howard and Scott Tingley) we beat to win the bronze medal. Interestingly, DJ and Scott went on to win 2 matches in the "Pro" doubles draw, giving Jordan and ​me a little bit of a barometer on how we might have done in that event. Our path to the bronze medal followed a loss in the second round of the main draw, and then 4 straight wins in the back draw. So, we were 5-1 overall. For some reason, the format didn’t allow the winner of the back-draw to compete for the gold or silver, so we finished with the bronze medal and just one loss, which we were pleased with. Overall, it was a great experience. It was awesome seeing the top players up-close. 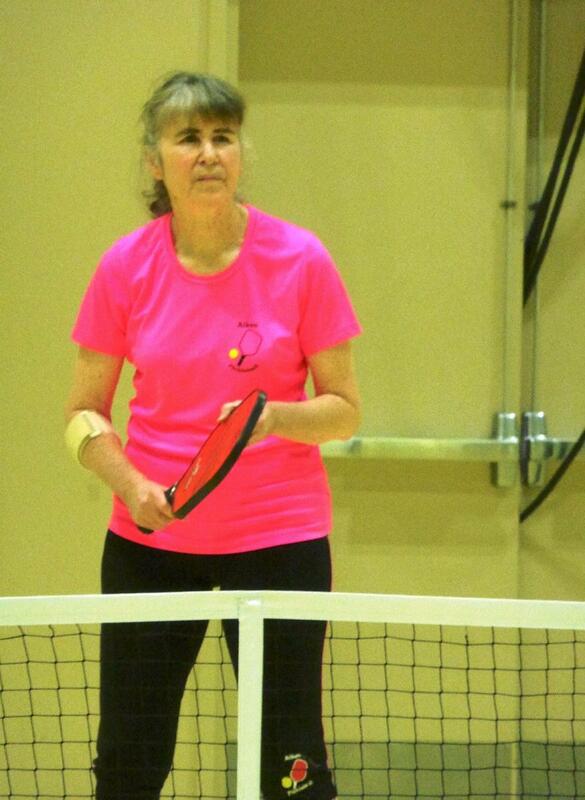 Anyone who loves pickleball should make the trip to play, or just hang out at this event. There were over 1800 people entered in the tournament, and the facility was unbelievable. The only downsides were the wind and the heat. We'll be back again next year for sure. "We played 9 matches altogether, in a traditional draw set up. The finals match was epic. Jordan and I beat Tommy Boyette and Justin Smith in a 2 out of 3 game format, but then had to play them again (one game to 15) for the gold, because it was a double elimination tournament, and their loss to us in the 2 out of 3 game match was their first loss. In the last game to 15, we were up 14-12 and had 2 or 3 high balls that we slammed pretty hard, and should have put away, but they somehow got them back, and won the point. Then we ended up losing 16-14 It was heart-breaking, but we are still pretty proud. We beat some other awesome teams, including the #1 seed." ​Mo Garcia entered all three events ~~ Singles 4.0, Men's Doubles 4.0: 19+, 35+ 50+ and Mixed Doubles​ 4.0: 60+, 70+, 80+. 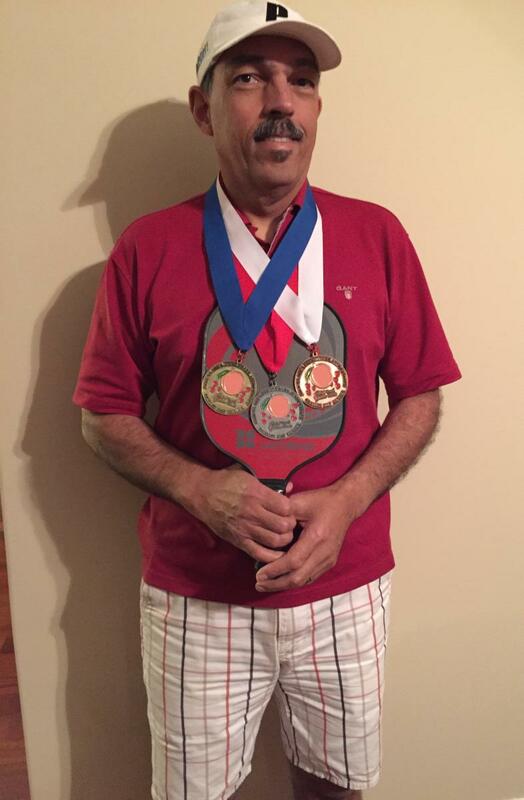 He medaled in all three events, bringing home the Bronze in MS, the Silver (with partner Les Massengale) in MD and the Gold (with partner Priscilla Chambers) in MX. If you see Mo this week, and he can barely walk, it's not because his legs are tired, but it's the weight of those medals he's wearing around his neck that is pulling him down! Great job, Mo! 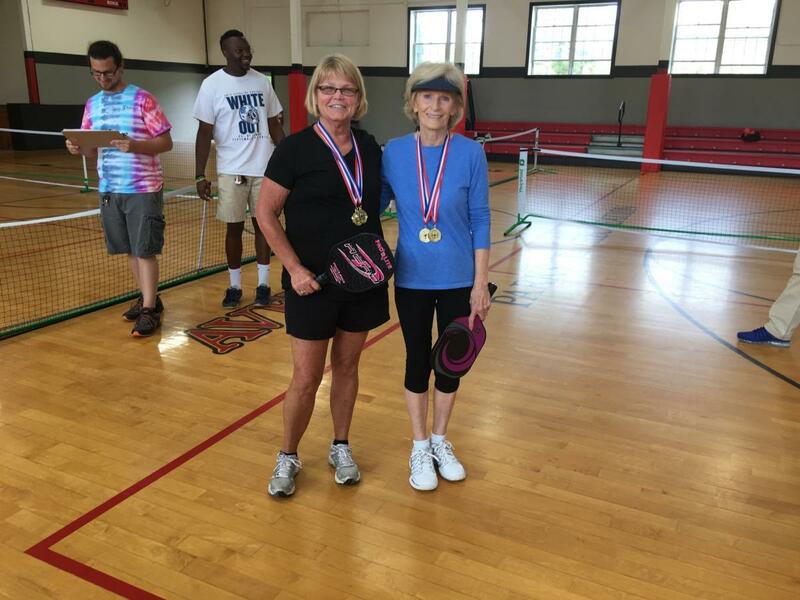 Vicki McNair and Joyce Noland represented Aiken well while competing in the WD 4.0, 4.5: 50+, ​60+ tournament. There were 11 talented teams playing and each match was hard fought! 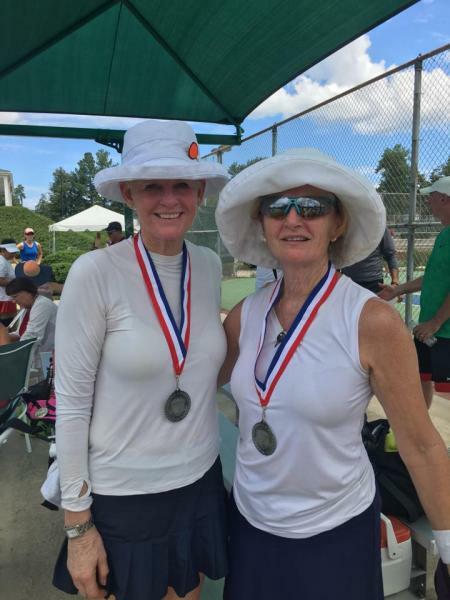 Joyce and Vicki won the Bronze medal. Terrific win for both of you! ​​Vicki was back on the court on Sunday partnering with a rested Tony Quick in MX 4.5, 5.0. They, too, faced formidable competition, and after losing a match in the upper bracket, Vicki said they had fun "clawing" their way back to the Gold medal round, where they had their second loss, giving them the Silver medal. ​Great effort at the highest skill level! While they may not have won a medal, Marian Garcia and Jim Kabel played hard and competed well in the MX 3.5: 60+, 70+, 80+, 90+ tournament. The experience they gained will hold them in good stead in future competitions. Many players commented on how great it was having other Aiken players/spectators at the tournament supporting them....it is that spirit that drives our players to play at the top of their game! And bringing home six medals is something everyone can be proud of! To see more pictures of the tournament, click here.